After meeting with the final members of our first batch of volunteers, we headed out to the small village of Dovan, in the Lalitpur district, just 3 hours south of Kathmandu, Nepal. Thanks to our excellent driver, our jeep was one of the smoothest rides we've had in Nepal. We arrived in a beautiful valley surrounded by luscious green scenery. 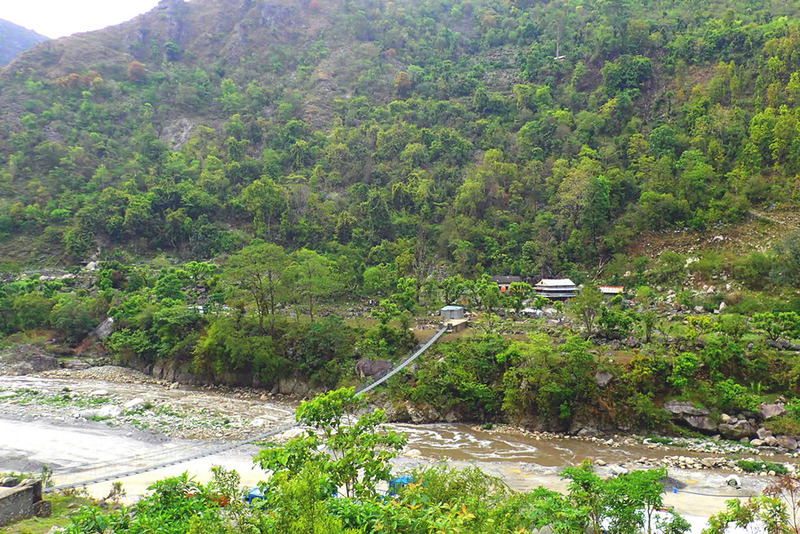 The school ground in which we were going to work on was located 10 min away from a suspension bridge, which we had to cross in order to access the main road. We loaded up our belongings on our backs and started our hike. When we arrived on site, to my surprise, the land in which the school was going to be build hadn't been prepared. So we got straight to work. We cleared out the area, levelled out the ground and started digging the foundations. Some of us did the digging and some started looking for rocks to form the walls of the school. At the end of Day 1: Already a lot of progress! The building materials used are iron poles for the sides and the roof, metal sheet, stone and cement. This cost and time effective method of construction is the standard government-approved model for building schools in Nepal. Thanks to our generous supporters, the money raised from our fundraiser will going towards labor and building material costs for this building project. Milan, our junior engineer helped with giving directions to the local skilled workers. Because it was the beginning of the construction, a lot of the work involved moving rocks. These rocks were taken from a previous building and would be used for the foundation and for the walls. We needed to collect a total of 800 cube feet of them! Here is a photo of the previous school. Although this building is no longer labelled as "unsafe" by the government after the earthquake, its visible cracks and unconvincing structure does not make this building safe enough for the children to study in. After the earthquake, locals patched up the cracks but some some still remain. Since this building is no longer being used, they made a kitchen out of one room that our Nepali cook used to make meals for us. The children currently study in another building just a few metres uphill of their old school. This building still stands fine though it is a building in which the classrooms are separated by wooden boards, therefore you can hear the students from the neighbouring classrooms. Every morning, the children would get to school early to see what we were up to. They would sometimes help us carry rocks and make good use of the wheelbarrow, which they had a lot of pleasure playing with. In the afternoons, the kids would spend time with some of the volunteers either drawing, playing games or making bracelets. At the end of the week, we took the opportunity to distribute school supplies donated from Jo and Giana's community in Montreal, Canada. The children really appreciated their new supplies! Living in the village for the week allowed us to reflect on ourselves. The discomfort of being away from our basic amenities like a western toilet and shower allowed us to appreciate the simplicity of our existence. We allowed ourselves to take the time to be in the present moment during each other's company and embrace the time spent with the children, which was our favourite part of being in the village. At the end of the week, we managed to dig out the foundation, put up the 10 support poles and gathered around 400 cube feet of rocks!! AMAZING JOB TO THE TEAM! We would like to extend a special thanks to all of our supporters who are continuously helping us make this project come true. We will be returning to Dovan, Lalitpur on June 19 with our second group of volunteers to continue the construction of the school and plan to complete this project by the beginning of July 2016. We are still raising funds for this initiative, so feel free to send in any amount wish to contribute here! Stay tuned for more updates on the progress of the school by following us on Facebook. Namaste, from The Travelling Movement team! Here are more photos of our week!